"Tweet & Beep: Social Media For Fleet Management"
Social Media Examiner reported this year that 82% of the Fortune Global 100 companies have active Twitter accounts. Since its launch in 2006, Twitter has become the social pulse of information exchange, where businesses communicate between clients and cohorts, building their brand presence online. Is your fleet company tweeting yet? In the past few weeks, we’ve discussed how fleet companies can use social media to promote their unique business identity and promote safety messages to employees. Now we’ll look at an inspiring example of real-life fleet tweeting in action. Rashid Temuri is unquestionably the most popular cab driver in Chicago. In 2011 he created the Twitter account @ChicagoCabbie, hoping to improve customer and driver relations in the city by responding to complaints online. He had been a taxi driver in Chicago for over thirteen years, and saw the cab community suffering from misrepresentation and poor driver behavior. However, what started as a sound-off board quickly turned into an interactive business channel. Temuri would shoot a tweet out at the start of each cab shift, allowing followers to track his location with Google GPS technology. People started to contact him for rides through Twitter. And Temuri responded. Using Twitter to notify customers of his estimated arrival, weather conditions, and daily discounts, amongst other friendly and conversational bites, he managed to gain more jobs on a daily basis than he could handle. Live tracking is the draw, and his engaging persona is the clincher. He currently has over 5200 followers on Twitter, and a fleet of cabbies to share the workload with. As we’ve mentioned before, cab fleets are often the pulse of city traffic flow, and contribute to the success of a community by providing an essential service. GPS tracking technology has enormous benefits for increasing productivity (and in turn, customer satisfaction), and our example today shows that with a bit of innovation, cab fleets can have an even more resounding impact. Fleets that use live tracking software distinguish themselves from their competitors, especially in fleet industries where face-to-face customer interaction is part of the service. And with over 175 millions tweets infiltrating the Twitter-sphere every day, efficient communication between customers and fleet employees is ripe for the picking. 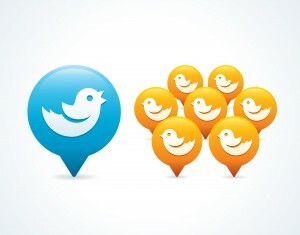 Whether you choose to manage your Twitter account from an administrative base, or offer Twitter communication to your drivers through track-able smart phone devices, there is a creative and compelling way to connect with customers online. Now that’s #smartfleetmarketing. Follow GPS Commander on Twitter as a resource for fleet management advice. With free articles published weekly on our blog, we want you to make the most of your fleet, cutting costs, gaining more business, and building the best employee team the way.